The New York Times continues its efforts to inculcate Americans with the value of wearing a hijab or scarf and expand their sympathy for Islamic modesty requirements. Today's print edition includes a feature story about a lawyer who started covering when she was in college, against her parents' wishes. The story sympathetically portrays the young lawyer's concerns about potential discrimination in hiring decisions and work assignments, and how she navigated them. It shares her piety, the "comfort and courage" she finds in her faith, and "elat[ion]" about the Supreme Court's recent decision in EEOC v. Abercrombie & Fitch. A Women In the World (WITW) feature posted June 7 on the Times' website shares the happy news about nylon sports hijabs, designed for the observant and athletic Muslim woman. The article calls the decision to substitute nylon for more traditional silk, chiffon, and cotton, "brilliant." The item concludes with the New York Times recognizing the "country" of Palestine, whence the manufacturer's parents came, and to which he wishes to sell his product. 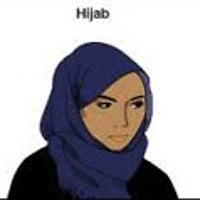 If any readers have examples of New York Times stories about either (a) Muslim women pressured or forced to cover against their will and/or repudiating the hijab/niqab/burqa (e.g., something along the lines of this item from the Daily Mail), or (b) warm and fuzzy stories about Jewish women finding value in dressing modestly and/or covering their hair and the discrimination they face, or other like stories about non-Muslims, please share them.